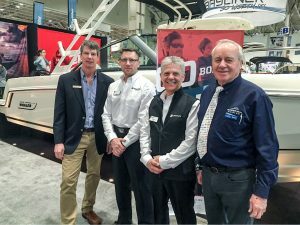 (L-R) Scott MacCrimmon, Art Bates, Mercury Service Rep., Jerry Simms, Technical Account Manager/Instructor, Mercury Marine, Bruce Hatherley, President, Gordon Bay Marine at the Toronto Boat Show, January 15, 2018. While at the Toronto Boat Show, Scott and Bruce Hatherley, President of Gordon Bay Marine took a moment to celebrate their shared success in winning a Mercury Service Customer Satisfaction Index (CSI) Award. Pictured with Scott and Bruce are Art Bates, Mercury Service Rep., and Jerry Simms, Technical Account Manager/Instructor with Mercury Marine. Ed Huck Marine and Gordon Bay Marine are two of the four mercury dealerships in all of Ontario to win this prestigious Service Award and amongst the top 10 dealerships in Canada. Recipients of this award have displayed an ongoing commitment to providing exemplary customer service and the award is based on the responses of customers.